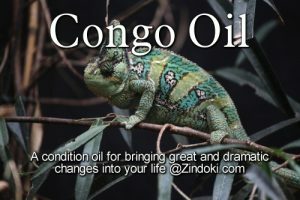 Congo oil is one of those things that everyone seriously has a different recipe for. Some of the ingredients that are fairly consistent are some herb with caffeine, something peppery, and something very fresh. Whichever one you get, it’s going to be deep, but like Tiger Balm for the soul. The variation is likely because different ingredients are available in different places, and it’s kind of important that some level of foraging be involved. There’s just something about going outside, seeing what’s out there, and using it. So as with most others of mine, view this recipe as more of a guide than a strict formula. Be advised though, that this will bring about rapid and great changes. Make sure that you are ready for what you ask for. It may not be a pleasant journey. (optional for additional Oya step) a piece of paper and a pen, bonus if you use some lampblack ink made from leftover offering charcoal and ashes. You can also use orange paper with purple or brown ink. Give some offerings to your Gate Keeper and Oya or your tradition’s deity of change, storms, and chaos. On the paper write down situations in your life that you would like to see change, or possible situations in the lives of those you may be serving, that you would like that batch of oil to cover. You can choose or add ingredients that are compatible with these. 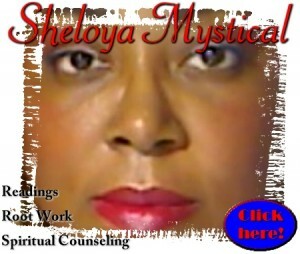 Arrange your ingredients on your workspace or altar and light some pleasing incense. Give the jar some smoke, and speak the word “CHANGE” into the jar with confidence. With a mortar and pestle, crush but don’t fully grind the bulkier ingredients, thinking of change and transformation as you add them to the jar. Don’t crush the animals if you add them though. Just add those whole. Take the paper between your fingers and put it in the jar, still holding onto it. Tear it up inside the jar and let the pieces that fall from your fingers just fall. Pour the oil over everything. Give the lid some smoke and then close the jar. Shake it very well like you are crazy, but hold on tight as these things with a lot of Oya energy have a tendency to fly. If you are a child of Oya, you may want to use a metal tin or thermos instead of a glass jar. Just make sure not to close it too tight if it’s a thermos. Wrap the jar in the cloth in a spiraling fashion. Let this set for 9 months…the same amount of time it takes a baby to develop. Consider all oils like a living being, but this one especially. When they are “born” open the jar and speak their name into them. I recommend one meaning change or something that changes like butterfly or a serpent or dragon name. When the oil is finished, you may resurrect and refresh them using the old sludge and adding things until they smell like something dead. Then wrap the jar in the cloth and give them a dignified burial with thanks offerings for all the good they brought you in their lifetime. Give offerings to your Gate Keeper and deity of change. Dip your fingers into the oil and then put your hands together. Calm yourself first, and then think of the things that need to change. Speak the things that need to change and how you would like them to change. Start hollering, low, graduating to as loudly as you can, as you clap nine times. If you are feeling the energy hasn’t finished coming through, do it again. Do this action as many times as it takes. When it is done, thank the deities for their presence and close the jar. If you must be quiet for privacy reasons, you can do it quietly rubbing your hands together, but the loud way is best. When this oil is made by a child of Oya, it can be a booster ingredient in other oils used in workings wherein great change is required for it to “stick”. If an addiction or bad habit needs to be broken or a connection severed, this is a good addition. It will tear things that need to be torn, and break things that need to break. Notice I am using destructive words here. So use this option with extreme caution or as a last resort when the normal recipe or tactics haven’t worked. To activate this oil in a way that someone other than its maker can use it, the portion must be purchased (in currency or barter of goods) in doses as needed. You can’t buy a stock for later. There needs to be as little time as possible between separation from its womb jar and its use or addition to the other oil or talisman. This oil can be used therapeutically in a situation where someone is going through great changes. Sometimes things hit some people harder than others. To help carry someone through a difficult change, draw a line of this oil around their ankles. 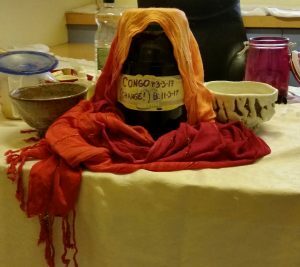 bring change, change, changes, condition oil, congo, congo oil, congo oil recipe, transformation. Bookmark. Congo oil isn’t a reversing oil per se, but it can definitely be used to boost something that reverses. It would make it more intense in the way of tearing through things they might have set up to protect themselves from natural consequences. One can’t really protect themselves from natural consequences, but one can slow them down to some degree. Congo oil would erode or if they were sloppy, just tear through those buffers. Thanks so much for your reply i was so sick thats why i delayed to replied thank again i wish u many happy blessing.